I received the May GLAMBOX a few days ago , and as usual i preferred to use the products a few times and do a haul/review post at once . This May, due to popular demand, GlamBox once again collaborated with "Benefit ", to create another exclusive, Benefit box. The box features a selection of Benefit’s most loved beauty essentials, and also is the launch platform for a brand new Benefit product that is yet to be released worldwide to the general public on July! اتمنى انكن في احسن حال ! قبل كم يوم استلمت علبة "جلام بوكس" لشهر ماي و كما العادة فضلت ان استعمل المنتجات اللتي تحتويها العلبة كي اكلمكن عنها و اقول لكن رائي فيها في مقال واحد . قامت "جلام بوكس" بالتعاون مع الماركة العالمية المحبوبة "بنفت" لعمل علبة مميزة تحتوي على مجموعة من اكثر المنتجات مبيعا لماركة "بنفت"و كذلك لاطلاق منتج جديد لن يكون متوفر في الاسواق الا في شهر يوليو ان شاء الله . 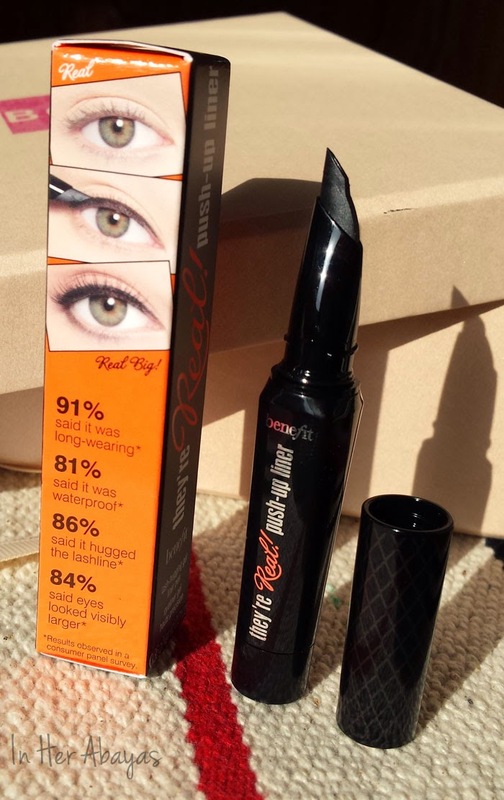 1- I start with the newly launched eyeliner from "Benefit" , "They're real push up liner" . It's a gel eyeliner in pen form , it has the innovative AccuFlex™ tip , a pointy rubber tip that makes drawing the eye line easier and closer the the eyelashes . I love this new product , but i need more practice to master using it . It's is definitely a revolutionary product and i think that we'll see some drugstore reproducing it anytime soon . It's very black , long-lasting , and relatively easy to use compared to regular gel eyeliners . i give it a 4.5/5 . ابدا بالمنتج الجديد من "بنفت" و هو قلم تحديد عيون اسمه "They're real push up liner" . و هو محدد عيون جل في عبوؤة على شكل قلم براس دقيق مطاطي يجعل رسم العين اسهل و اقرب لخط الرموش . حبيبت هذا المنتج و هو فعلا منتج ثوري اتوقع ان تقوم ماركات و شركات اخرى بتقليده قريبا جدا . محدد العيون "They're real push up liner" يتميز بلون اسود غامق جدا و يدوم مدة طويلة و هو سهل الاستعمال مقارنة مع باقي محددات العيون الجل. 2- The second product is the "big easy" multi-balancing complexion perfector . This is a lightweight foundation that goes from liquid to a velvety powder finish and that is supposed to perfect the complexion , and balance moisture and controls oil. I used it one time and just hated it ... it dried out my skin and i could see dry patches all over my face . but then later i read on the "benefit" website that it should be applied to moisturized face . so I'm going to give it another shot and keep you updated about what i think of it . المنتج الثاني هو "big easy" , كريم اساس يعيد التوازن و بخفي عيوب البشرة . و هو كريم اساس خفيف يعطي مظهرا مخمليا ناعما و يغطي عيوب البشرة و كذلك يوازن نسبة الرطوبة و الزيوت فيها . استعملت كريم الاساس هذا مرة واحدة و لم اعجب به ابدا , فقد احسست انه قام بتجفيف بشرتي و اظهر بقع جافة على وجهي . و لكني قرات لاحقا انه يجب استعماله على وجه مرطب مسبقا . ساقوم بتجربته مرة ثانية و اعلمكم يرائي فيه في وقت لاحق ان شاء الله . 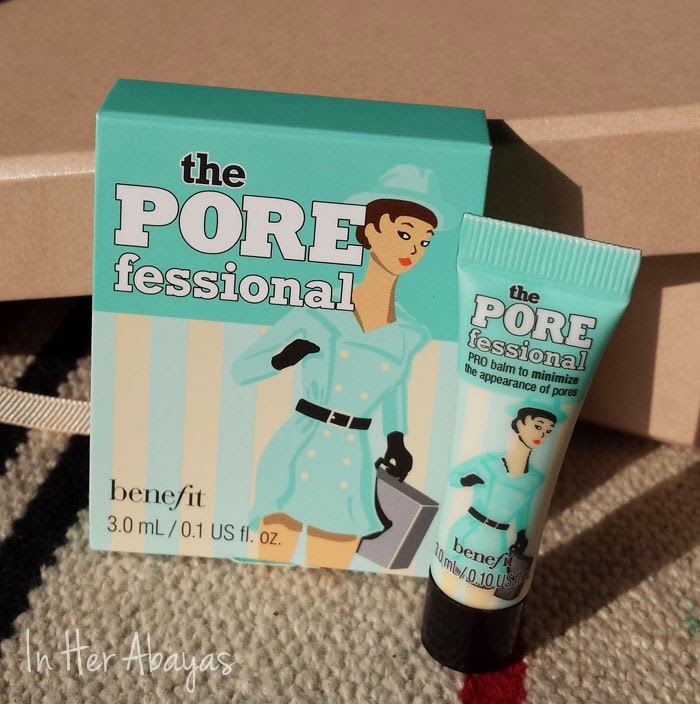 3- The POREfessional , the most famous primer in the market and my all time favorite . I've talked about it in previous post all i have to say about it is that i love it and it deserves a 5/5 . this tiny one is really practical for touch-ups , so it's going in my makeup bag ! The POREfessional هو اشهر برايمر حاليا و هو المفضل لدي . تكلمت عند في مقالات سابقة و لكن باللغة الانجليزية . The POREfessional هو برايمر يوضع قبل كريم الاساس لينعم البشرة و يخفي المسامات و الخطوط و يعطي البشرة ملمسا سلسا و يساعد على تثبيت المكياج مدة اطول . يستاهل 5/5 . 4-"Fakeup" a hydrating crease-control concealer that hides dark circles & diffuses fine lines for a silky smooth, ultra-natural look. Available in three shades, it’s proven to keep skin hydrated for 6 hours! I like the idea of having a moisturizer and concealer in one product, it helps applying the concealer evenly and keeps the under-eye area moisturized . even if it creases a little i still like it i give it a 4.5/5 . 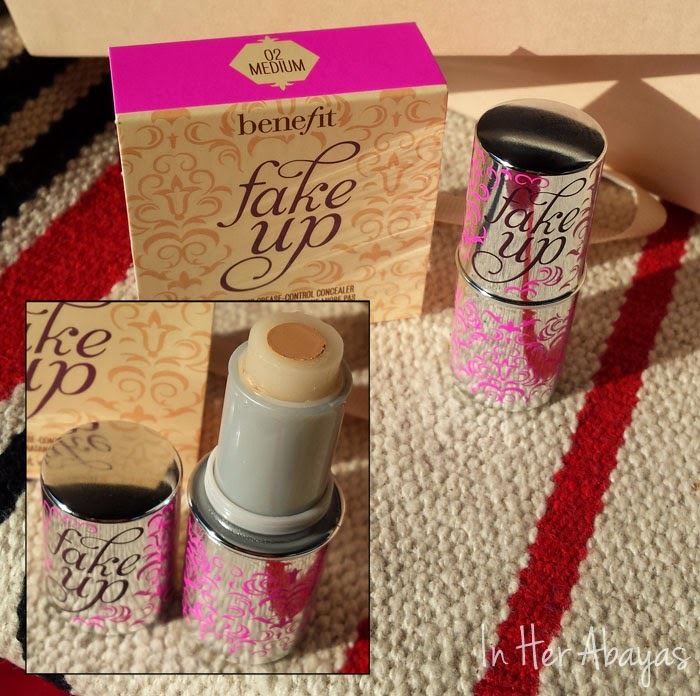 "Fakeup" هو خاف لعيوب البشرة يغطي الهالات السودات تحت العين و يعطيها مظهر طبيعي يدوم الى غاية 6 ساعات . حبيت فكرة وجود مرطب مع خافي العيوب في منتج واحد لانه يجعل وضعه اكثر سلاسة و يحافظ على منطقة اسفل العين مرطبة. بالرغم انه اظهر بعض خطوط الانكماش تحت عيني فانا اعطيه علامة 4.5/5 . 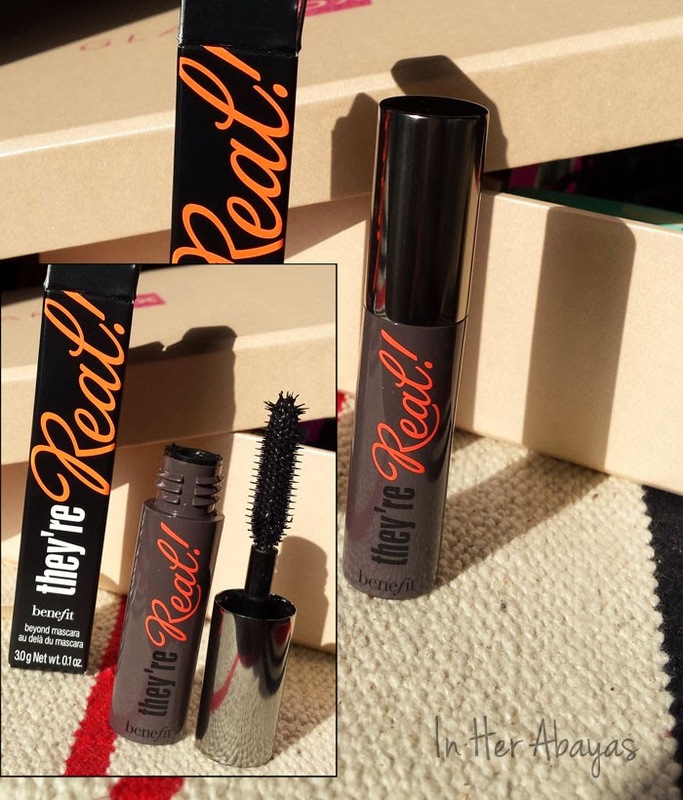 5- I saved the best for last , "They're real" mascara ! It's super lightweight , lengthens, curls, volumises, lifts and separates the lashes without smudging or drying out. i thing this is the best mascara I've ever tried 5/5 . و ختامها مسك !مسكرة "They're real" ! 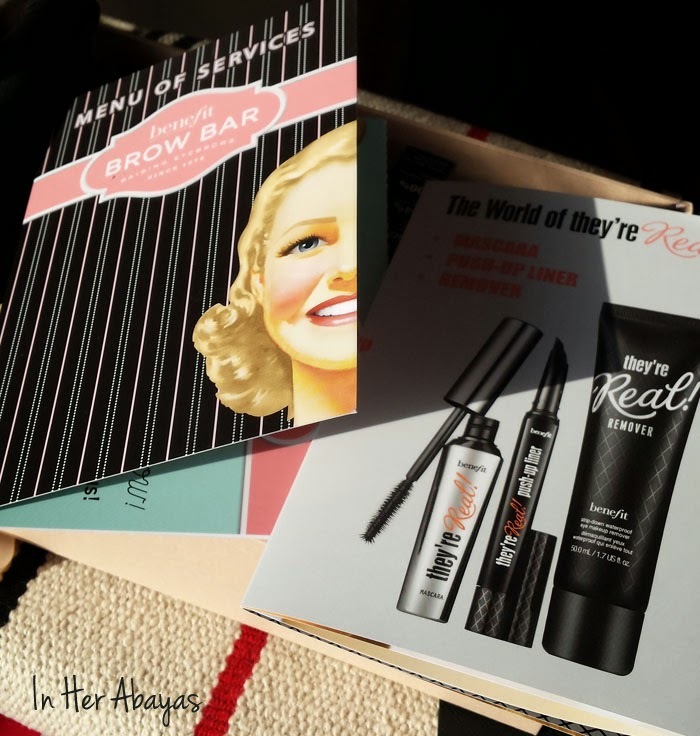 The May Glambox also included a how to use the "they're real" products manual , the menu of the Benefit Brow Bar and a voucher for a brow dye . So that's it ! it's a pretty interesting box this month right? 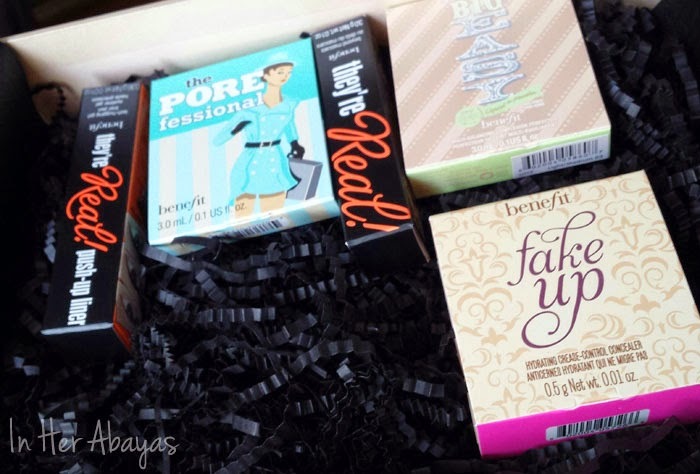 what's you favorite product from Benefit? علبة هدا الثهر كانت مميزة اليس كذلك ؟ ما رايكم بها ؟ و ماهية منتجاتكم المفضة من ماركة بنفت ؟ اشوفكم قريبا ان شاء الله ! سلام !